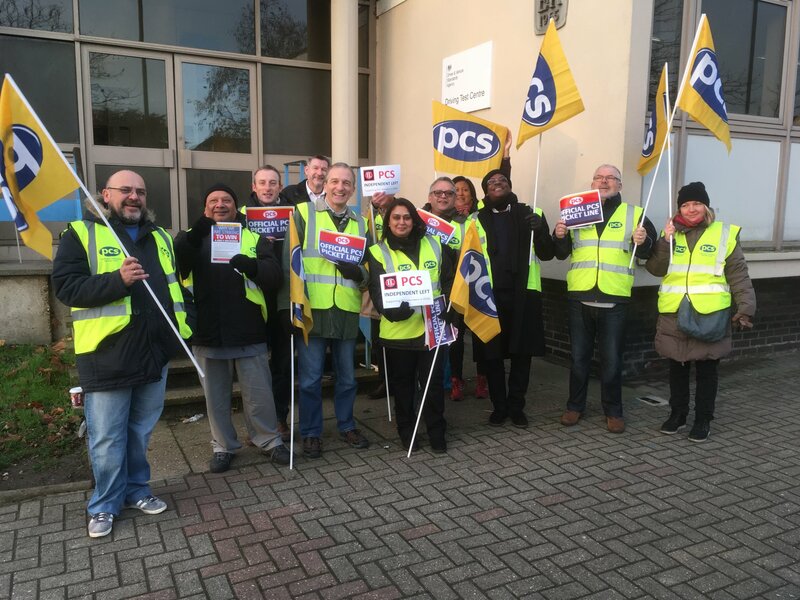 On 4 and 5 December, PCS members in DVSA, an agency within Department for Transport (DfT), took strike action. The strike concerned payment for all work related activities, in particular travel time between workplaces. Presently DfT will only pay for a certain amount of the time spent travelling. The union of course wants all the travel time to be paid. The strike was well supported overall but there are clearly areas where the union has to work to improve the turnout next time. The next, and in some ways more important phase of the dispute, centres on work to contract action. DfT introduced a new form of driving test on the 4 December, over the strong objections from the union. The Department wants a fixed number of tests to be carried out within the working day. The problem is that this cannot be readily done as the new test is timed longer than the old test, so many Driving Examiners will find themselves not being able to ‘fit’ in the last test into the working day. They will be forced either to cancel this test (which is what working to contract will mean) or take the test but work ‘over time’ for no extra pay. The test itself also has dangerous features that are supposed to mimic real world driving but will increase the chances of accidents on test. Working to contract means stopping a test if the candidate is driving dangerously rather than guide the candidate back to base. Using this tactic will mean many cancelled and stopped tests, all of which hits DVSA’s bottom line. The government has demanded that PCS end the dispute before it will start talks aimed at resolving it. PCS has rightly rejected that demand. Interestingly, the Labour Party has now intervened and written to the DfT Secretary of State saying that talks must start without any preconditions. Given the specific nature of the dispute it is probable that it cannot be escalated to the rest of the Department but nevertheless the wider union can and must show solidarity even if only in the form of fund raising. The dispute can be won but it probably will be a long struggle. In principle, if you carry out a work related activity then you should be paid for it. No free work should be allowed.